The only two neurones, surviving in the super-warm season, clashed in my head: dolphins were declared “non-human persons” WHILE humans started to eat artificial burgers coming from stem cells. Are we actually now living in a science fiction world? IMAO, YES. But let’s me start from the beginning and explain why -regardless animals or food ethics- my brain had a clash -and- why I think these news are the perfect starting point for a complete rethinking of the role of animals, with a very large impact on everything from religion to aliens. 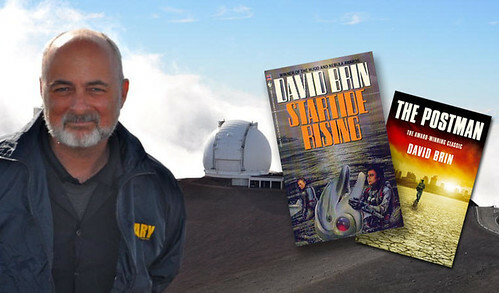 In 1983 David Brin, a science fiction author, published a novel entitled “Startide Rising”. In this book Dolphins, whose DNA has been modified, travel in space together with humans. Actually, thanks to their natural ability, dolphins are flying the space ship. well, he is an American scientist and award winning author of science fiction. Most of you provably don’t read science fiction books, but many of you might remember the post apocalyptic Kevin Costner movie “The Postman”, that comes from the homonymous Brin’s novel. Startide Rising’s evolved dolphins shocked me. The idea that various animal species coming form Earth were collaborating as a team, leveraging the specific characteristics of each species, and representing the planet, was just GREAT. Hey, but wait a moment! A dozen of questions are racing in my head. What happened to the idea that animals and all of Nature were introduced by God in order to serve us? What happens to Man at the center of everything on Earth, created as image and likeness of God? Regardless about religion, just the logic might drive us to the idea that humans are by definition superior to all animals. At least because our brain. Well, actually -as brain size- we don’t have much more brain than dolphins! In fact their brain is big like an human brain. We feel our self -as humans- superior to any species. Perhaps someone might raise a doubt regard dolphins, but we certainly are superior to dog and cats, that are welcomed in our families and loved as relatives. Well, also because it’s certainly easier to meet a cat or a dog than a dolphin. For example, I never saw or touched a real dolphin until I was 28. We swam together, humans and (many) dolphins, in the same “closed” area of ocean that is part of Xcaret Park, and believe me if I say that I didn’t feel superior in any way to these incredible creatures. If dolphins are non human persons and dogs/cats are relatives… Should we all become totally vegan? Well… I don’t know about you, but I am not ready for it. Dolphins are part of our teams just in science fiction right now, and a few thousands of kilometers away, they are just “natural resources”. This without mentioning that cats and dogs are food in many places around the planet, even some European regions included! Far from me to try to solve the huge planetwide hypocrisy, at least I tried to “solve” my personal one, but because BBQ I was forced to escape the problem with a very classic trick: forget the question for a while. The time will provide the answer. Well, to be totally honest, at that time I didn’t believe that the future would actually provide an answer. The idea of technology acceleration was too far from me and my Commodore 64 to be confident about it. While today, because of the technology acceleration (read Singularity if you want), we have more than a foresight of the future we want to build, and, because the choice of specific humans, we are getting closer to the answer that I was looking for. Technology will provide us soon enough answers to understand that Dolphins, Humans, Dogs, Mosquitos, we all are species with dignity and rights, as Non-Human Rights Project already started to promote. The needed technology could be the ability to edit animal DNA and close the gap between species, as Brin expected. At the end of the day, it could be a great way to say thank you to our ancestors. In fact, to be totally coherent with Darwin, humans could not be here without the contribution of most of the other living species which preceded them. Perhaps the technology that we should find should be the ability to produce an unlimited quantity of without touching the animals. Synthetic food, I mean. Should we be thankful to synthetic food? Will it be safe or are we all going to be zombies or finish like the aliens invading us the “War of Worlds”? “It’s really just proof of concept right now, we’re trying to create the first cultured beef hamburger. From there I’m optimistic that we can really scale by leaps and bounds”. …and I believed Brin (Sergey: Google) instead Brin (David: Science Fiction Author) since I read this other news from Thiel. He thinks differently respect HAM-Brin-URGER and recently funded a company that is even more science fiction than any “proof of concept burger”. Their goal? A 3D MEAT PRINTER! What else? Even beyond ethical reasons, lab-grown meat has intrigued people from decades. Humans eat about 240 billion kilograms of meat each year and according to the Worldwatch Institute, meat consumption will double by the year 2050. This number moves humanity from an insane voracity to a totally not sustainable demand. What will be the taste of a a 3D printed burger? Who knows? Probably it will depend from the printer brand and model, or perhaps we could add any taste to our burger, like any ink to our printers today. We could imitate a real cow burger, or try something unexpected like a butterfly burger, or, even more sadly, a fancy alien burger inspired by some blockbuster. And at that point, when we will have all the food we need: we will still think to be a superior species? We should be careful about this idea of superiority, because the moment of contact with alien species still far in the future, but potentially closer than ever. And really advanced species visiting from other planets could consider us “inferior” the same way we consider all the other Earth species today “natural resources”. Can you imagining yourself, visiting another planet, hunting and eating the prey? I don’t think I could. I would be too worried carrying inside my cells, everything that evolved on my home planet, with dangers that I could not imagine. At that point, our supposed superiority on the wild animal world will be definitely gone. Luckily we stay Masters with respect to our Machines, and the machines are going to be uncountably numerous. In this sense, our empire of the mind will be bigger than ever. The definition of a non-human person doesn’t specifically mention dolphins or any other entity. To be a non-human person is a STATUS, that theoretically could address any creature, as well as anything that will express the same abilities. Which abilities? Having sentiments, feeling love, happiness, hunger, fairness, desperation. How far we are from machines that mimic these human behaviors? Not so far. And while we are waiting, we are taking our robots into our cars, as entertainment, as well as into space. Kirobo, a sort of “Astroboy”, will be sent to the International Space Station by the Japanese Space Agency, to alleviate the isolation of astronauts, throuch conversations with it. 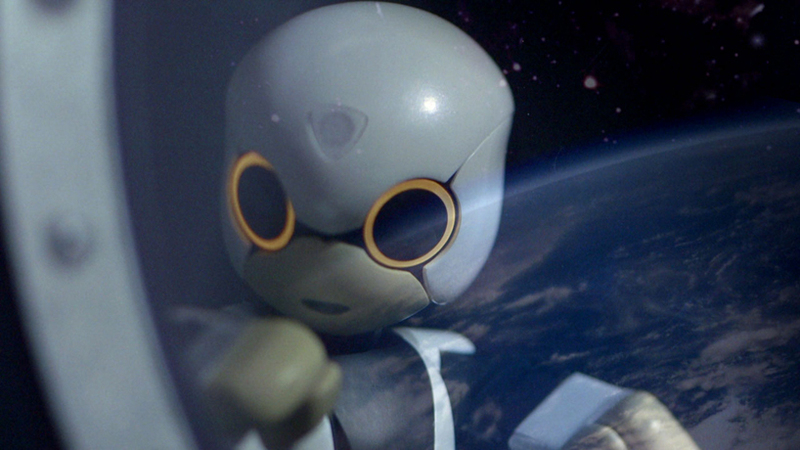 Kirobo will be the very first humanoid in space, and it is there to entertain humans. What a dolphin-destiny for a machine! Today we are NOT modifying their DNA, but certainly we will close ALL the places where they live in captivity, and where they are used for entertainment. Dolphins are maybe the luckiest creatures besides humans. Reading science fiction books, you can meet dolphins in many situations and always with a special role. For example, in “Hitchhiker’s Guide to the Galaxy”, dolphins are the only species to feel the danger and leave Earth (obviously flying) just a few days before its total destruction. Well, I want to have my own memory of dolphins! So, please, give me a dolphin burger before I change my mind: BLOODY!